A Judith March Motto for 2014 + a Giveaway! Hello & happy Monday! I am basking away in the land of blogging today because it's a vacation day from school - woohoo! It's always good to kick off a week that way, but it's even better to add a giveaway to the mix, no? 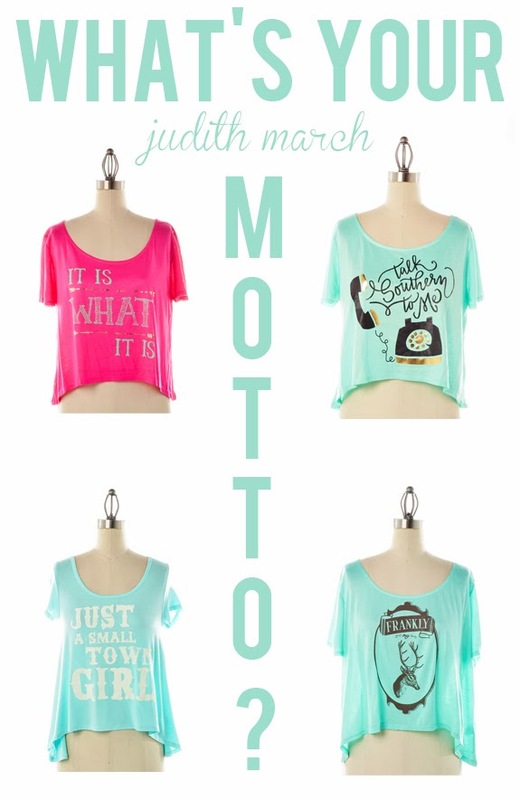 For the past few weeks, I've brought you a few giveaways from Judith March - we started with koozies & tumblers, then moved onto Home Sweet Home tanks, and this week, it's all about the motto. One of the reasons I truly love the Judith March line is that not only are their frocks simply adorable, but their tees and tanks are just plain clever. This week, you have an opportunity to win a motto tank for yourself. Enter below & good luck! I like the frankly my dear! thanks for the chance! I love the "Legends" styles! talk southern to me love it! Loving 'Just a small town girl'!!! Love just a small town girl! Talk Southern to Me is the cutest saying on a shirt ever! Just a small town girl! Love the new fashion for spring! Thank you for keeping me beautiful! Love it is what it is!! And any Judith March! I love the "just a small town girl' shirt! It describe me perfectly! Thank you so much for this giveaway!